Around a half century ago, Mr. Yuji Takimoto, alias a “Japanese brown cattle doctor”, began to study the Japanese brown cattle (Akaushi). Since then, the way Akaushi have been raised has changed from a basic “raise, eat and research the Japanese brown cattle” to a more natural technique “grass fed delicious beef”. This empirical study cultivated in Aso Ubuyama-Village has seen a flowering of the technique. Traditional agriculture of the Aso prairie was authorized by the ” Globally Important Agricultural Heritage Systems (GIAHS) ” from Food and Agriculture Organization、(FAO). 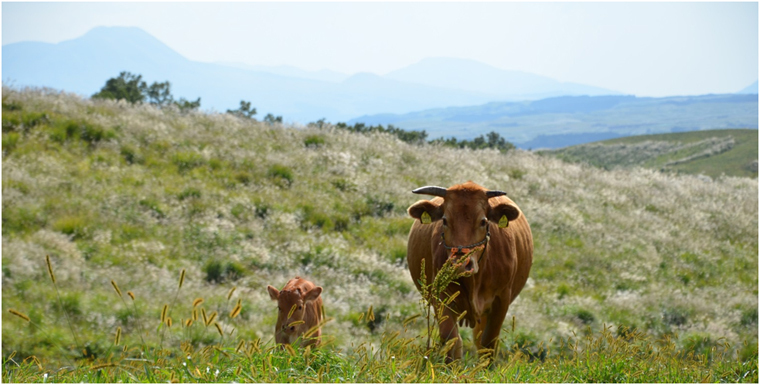 Now, the passion of the joy and development is prospering at prairie reproduction in Aso. Mr. Takimoto, who knows of the improvement of the Japanese brown cattle breeding and all the pasturage, is an expert in the charm of the Japanese brown cattle. 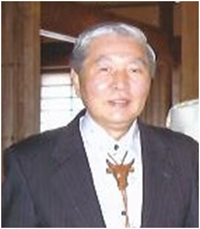 Dr Takimoto was born in Hokkaido, Tomamae-cho in 1941. He graduated from Obihiro University of Agriculture and Veterinary Medicine. He has worked with the Ministry of Agriculture, Forestry and Fisheries, also Kyushu, northeast Chugoku and Shikoku Japan at the various National Agricultural Experiment Stations. He retired from his office as the foreman of the northeast National Agricultural Experiment Stations in March, 2001. He became the Hokkaido National Agriculture and Food Research Organization Region representative from April of the same year, and retired in September, 03. He moved permanently to the area of Aso Ubuyama-mura as of October. He then taught about the breeding of Japanese brown cattle, etc. at a “country cram school” located in a private school in the village. He also guided pasturage breeding of the Japanese brown cattle in Hokkaido as an adviser of the Jinnai Farm 21 for two years after 2007. Now, he works at being a Japanese brown cattle registration association president, an advisor for the agriculture-and-forestry fishery Japan Association of Corporate Executives Kyushu head office, served on an all Japanese brown cattle beef association manufacturing technique committee, and also as an Ubuyama kamitajiri bokuya union adviser. The animal we know as a cow began genetically around 90 million years ago. Around 8000 years ago, the original cow called Bos primigenius started to be kept by people and became livestock. Various views see the evolution of the cow now recognized as the brown Japanese cattle coming from the species of the Higo(kumamoto) and the Tosa(kouchi) coming from the original Bos taurus coreanae（Korean cattle）. The history of a brown　cattle“Akaushi” is venerable, and when the Japanese Emperor “TAKEIWATATUNOMIKOTO” reclaimed the lake in Aso and having made fields and began agriculture, it is told that oxen and horses were kept from him. Akaushi” by crossbreeding the Devonshire cattle at this time. However, the size of the cattle became excessive and the improvement by the Devonshire cattle was interrupted for the reason that it interfered with the cattle’s ability work on the farm. A.D.1900(meiji 33）, The government then defined the plan which would improve Japanese beef by crossbreeding with a foreign kind of cattle in order to convert a cow into a type that could work and provide beef. This was achieved by creating “Akaushi” from combining a Simmental cattle breed, a Brown Swiss cattle breed and a few other few foreign kinds of cattle. A.D.1911（meiji 44）,In response to the fact that mating of Japanese beef and a foreign breed was promoted nationally, a Switzerland native Simmental cattle breed was crossed with the “Akaushi” in Kumamoto to improve the breed. A.D1914（taisyou 3）,The government at this time enforced a new rule for cattle breeding that forbid the mixing of the red hair cow with the black color cow. This ruling came from the the Ministry of Agriculture, Forestry, and Fishery. A.D1922（taisyou 11）, By this time, mostly Simmental cattle were now being crossbred. Selection of the hereditary increase of the physique and brown hair, as well as making an economically viable combination cow was the target to achieve by having a 25% mix of the Simmental cattle into the “Akaushi” was the clear intention. The single brown combination cow made as a result was created by Japanese brown cattle, and also it was improved by direct and indirect governmental official approval, and spot official approval, ET (embryo transfer) cow fabrication, etc. The thought “I would like to create a strong cow more as an object for working roles” seemed to be the improvement but also put the objective for good meat into view as an important aspect at the beginning. By 1944 (Showa 19), it was decided that the Japanese brown cattle had then developed a good genetic breed which did not generate variation by mating. The feeding trial of the”Akaushi” began from 1960 (Showa 35)　in the Kyushu National Agricultural Experiment Stations, the Kumamoto National Livestock Breeding Stations, and the Kumamoto National Institute of Animal Industry. Both direct and indirect official approval of the capability of Akaushi were started as an “officially approved stock raising beef enterprise” which summarized Japanese beef after 1967 (Showa 42). In 1974 (Showa 49), Kumamoto Prefecture planned the central control enterprise of the Japanese brown cattle　since the Japanese black cattle breed was already established. The promotion on meat distribution enterprise from supply beef was started from 1975 (Showa 50). The Kumamoto stock raised sales for the Federation of Agricultural Cooperative　Associations, the Federation of Agricultural Cooperative. The on-site license examination of Japanese brown cattle capability was carried out by Unions over five years. The objective was to have the cow from Kumamoto as a “Higo cattle” from 1984 (Showa 59) at branding. Improvement in physical size of the “Akaushi” was aimed at through the following things; the speed of improvements in the breed is increased, making full use of ET technology, and trademark registration of “UBUYAMA SAWAYAKA BEEF”, the “ASOOH”, “KUSAUSHI”, etc. 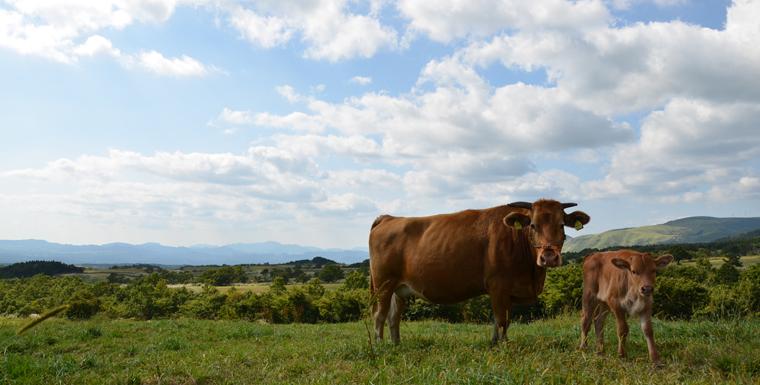 is carried out to become the basis of today’s national brand of “japanese brown cattle ” (natural, juicy, and healthy). From work cattle to a beef cattle. It was 1965 (Showa 40), that I started for my new assignment to the Kyushu National Agricultural Experiment Stations, the Ministry of Agriculture and Forestry. “I found I wanted to resign in the research of Akaushi in just three days.” — Why was it? It was because the tractor was introduced into farmland work and Akaushi as work cattle finished in that role. The boss said to me “I do not want to be ruined and to do research of a cow which will die out as a breed.” He also said “The present role of the Akaushi is as you say. However, they are not work cattle. Remake the breed of Akaushi as a beef cattle. Build the plan of logic for that and the technology required.” At that time, the use of a chemical fertilizer began to spread through agriculture instead of the compost as used in the past, and the prairie was losing it’s usefulness. The number of farmhouses which kept cattle decreased in number, and if the land becomes a bush in which shrubs grow thick, without taking care of field, etc., Akaushi of Aso and the prairie land will be ruined. I, who felt a sense of crisis to that began to explore the technology of “breeding the beef cattle which makes good meat using natural grass as a food source. “The breeding examination was started by the proposal of the dairy farmer Hiroaki I in 1975 (Showa 50) at Ubuyama Village. It was the two concepts of using natural grass as a food source and the usage of pastures to increase the Akaushi breed’s health that I tackled together with 12 succeeding farmhouses in five years. The former concept led to the fattening a cow using grass as feed and the latter concept involved the methods of pasturing used previously from cattle breeds which needed the high amount of nourishment according to the growth stage of the cow. Five Akaushi cattle were kept as study subjects and the result which I researched in the Kyushu National Agricultural Experiment Stations was implemented. This research led to a consistent management system which deals with both pasturage, breeding, and fattening was established for the first time in the whole country. The “Natural grass feed method for stock raising engineering manual” created in 1981 (Showa 56) is the compilation of the results of our experiment. As a result of making a manual from the empirical study from the research, it turned out that Akaushi is a kind of breed which can perform high meat production with a grass feed. The Ubuyama Kamitaziri bokuya association won the Ministry of Agriculture, Forestry and Fisheries Grand Prix prize in the 14th national grass feed stock raising contest in 2010. This award helped to spread the importance of the feed base in stock raising management, the excellence in production, the management system, etc. of the Akaushi breed which partnered with the efficient use of technology in grass production of self-supporting feed or grazing land. In “The International Conference on a World Agricultural Heritage”, the maintenance and sustainable agriculture of the prairie in Aso was authorized as a new world agricultural heritage in 2012. Management of the prairie by pasturage, mowing, field ware, etc. and practical use of not only stock raising but the prairie were jointly controlled per farmer co-operative. Exploitation of continuous grass resources was successful over many years, and was accepted as a useful method, I was extremely glad that our empirical study was able to give so much help to the local farmers. The transformation of the Akaushi growing up with a grass food source. Why does Akaushi develop such nice meat with a grass food source？Let’s explain a few aspects about Ubuyama Brando’s “Kusaushi” breed. A cow is a herbivorous ruminant with four stomachs, originally eating much wild grass and growing up in a prairie. Digestion of the fiber feed ingredients are made easy to absorb by work of a microbe called the protozoa in the stomach and other bacteria. Not only absorption of nutritive substances is important, but in order to have a healthy cow, you have to make sure the vitamins and minerals of the abundant grass are digested as well. With Japanese black cattle, parent-and-child pasturage is the normal method. Japanese black cattle farming separate the mother and calf in several days after being born generally, and a calf is fed with substitution milk and a concentrate feed in a barn. In the case of pasturage, the beef will not become marbled. The Akaushi are not fed concentrated corn feed, wheat, rice bran, soybean cake, barley, etc. Since it’s mouth is large and Akaushi has a good appetite, shortly after it eats many cereals with many nutrients, it will grow fat and it will develop greasy, unsavory meat. If good grass is grown and given as feed, the mother gives out healthy milk, the calf drinks the milk, and since how to eat grass is learned from mother, the Akaushi can continue to make delicious meat from eating natural grass. It increases production and sales by making “Kusaushi” into Brando type meat by the natural coarse feed type fattening method in Ubuyama village. A proof of health is a color of fat. The Akaushi population which was 550,000 animals 55 years ago has dropped to only 25,000 animals now. In spite of having converted the breed into the kind used only for meat instead of work, the numbers of cattle are becoming fewer steadily. Then, the little of Sashi, or the marbling of the meat, of Akaushi was not evaluated in the market. In addition, having been mixed with the cheap imported beef which appeared on the market in large quantities by liberalization of imports of beef, BSE, the damage caused by false rumors of foot and mouth disease, etc. have damaged the Akaushi cattle brand. Although the wholesale buyer of meat says, “An Akaushi has yellow fat and is useless”, it is the light cream in which beta carotene is deposited, and 8~15% of moderate fat is included. In “reddish brown” meat, this is a proof of the health of the cow on account of herbivorous feeding. BSE and foot and mouth disease are unrelated to it, instead it is from the raising procedure of the Akaushi of pasturage and with a natural coarse feed. In the past, it was difficult to research the scientific data of chemical analysis of the “taste ingredient” and it was not completed. Today with scientific advances, “healthy functionality ingredients” are shown having solving any concerns. Akaushi is that vitamin A (retinol, beta carotene) and vitamin E (alpha tocopherol) are rich, and n6-/n3 ratio of unsaturated fatty acid is low. It turns out that this is based on pasture intake and the nutritional information which grass has is accumulated in the inside of the body of a cow. An immunity adjustment action and an antiaging action of a cell formation of fatty acid balance good for health, etc. to have high nutritive value. There is also a tendency for the functional ingredient which has an effect in health enhancement, such as carnitine and creatine to increase. According to the newest result of research of National Agricultural Research Center of Kyushu Okinawa Region, all contain 1.2~2 twice [ black-colored ] as many quantity as this. Furthermore, the inosinic acid and the amino acid of a taste ingredient are abundant, and also there is much collagen content good for skin. It is healthy meat from the healthy cow which a small child is also made to eat in comfort by the senior, and future says the spread of Akaushi as acting before the audience against the background of the health consciousness of a world. Copyright © 2013 Yuji Takimoto,Yamanosato. All rights reserved. Copyright © 2019 Aso Yamanosato All rights Reserved.